This was the victim's fourth rescue of the day. Creative Commons photo. MTN. 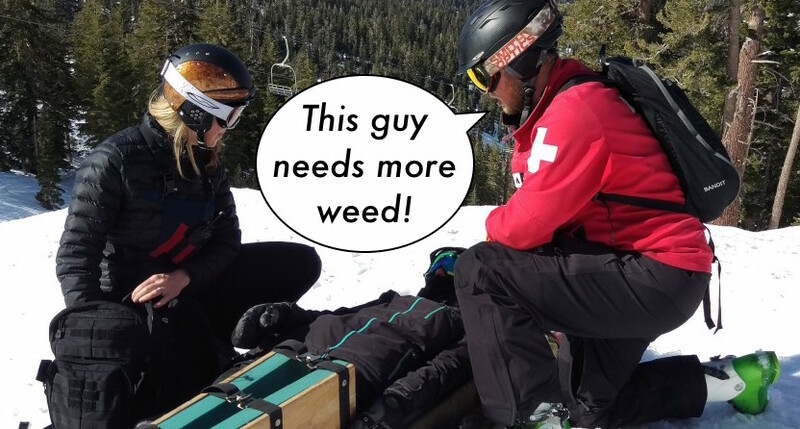 TOWN, USA — Asserting they need new strategies to combat injury at American ski areas, a growing number of patrol teams have recently turned to an unlikely tool: cannabis. The controversial "Green Patrol" initiative began last winter, when a pilot program at Colorado's Epic Mountain Resort equipped its ski patrol with shatter, vapes, as well as strains of indica, sativa —and numerous "dank AF" hybrids. The leader of Green Patrol, Epic Mountain ski patrol manager Greg Johansson, is currently touring the country training other patrol teams how to effectively integrate cannabis into their first-response protocols. "Sometimes, a rescue just needs a fat spliff," Johansson told TGR. "Sure, a broken leg is a broken leg, but a little Blueberry Dream/Headband sure doesn't make it hurt any worse on the ride down!" One of the first skiers to receive the upgraded rescue was Thomas Upton, 25, who enjoyed the life-threatening emergency so much that he had several more "accidents" for the remainder of the ski season. I just get up to the top, make my skis into a standing 'X', and then wait for the party train to roll in. "I don't even fake it anymore — I just get up to the top, make my skis into a standing 'X', and then wait for the party train to roll in," Upton yelled over the cacophony of a Phish-cover show in the background. According to Johansson, Green Patrol will only be integrated into states where cannabis is fully legal, such as California, Colorado, Oregon and Washington. So for now, he says, "the struggle will continue for skiers and snowboarders in Utah, Idaho and Wyoming." Get Happy New Year Images, SMS, Wishes and much more things.